Gmail has been the e-mail provider of choice for many people for a long time. In fact, it is the world’s largest e-mail provider. People love it for its simplicity of use, its spam-filtering capabilities, and its range of complementary products, such as Google voice, Google hangouts and chats. However, Google made a big change to its e-mail service this month, and many users are not happy. 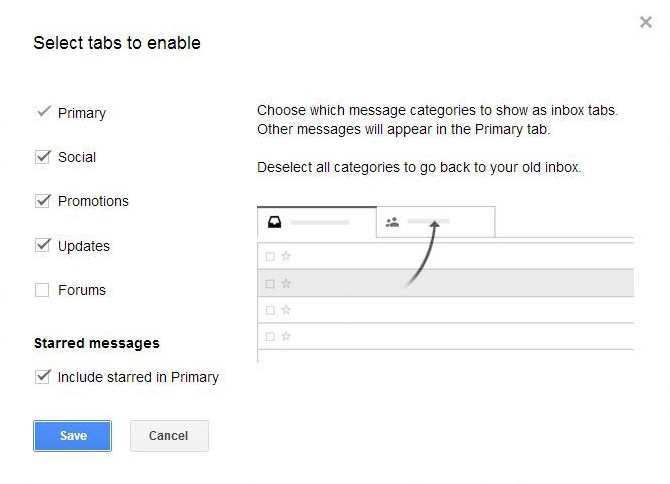 Gmail now features three separate tabs for each user’s inbox: Primary, Social and Promotions. E-mail is automatically filtered into these tabs, whether users ask for it or not. The social tab usually caches items that are from Facebook, Twitter or other networking sites. The promotions tab usually groups together items from sites like Groupon or LivingSocial, but it also includes most company newsletters or e-mail blog updates. The idea was to reduce your inbox clutter, but a lot of people – like me – weren’t too happy about Google’s automatic filtering and have gone looking for how to change their inbox back to the way it used to be. 1. Open your Gmail settings. This is the little gear icon that appears under your Google+ picture in the upper, right-hand corner of your mail box. 3. Click the boxes you want to enable. If you only want to have one tab for your inbox, make sure that only the “primary” box is checked. Click “save” and you’re done! Of course, if you want to add the tabs, this is the same method you would use. You can also add the “updates” and “forums” tab here. If you aren’t sure what kind of e-mails are included with each tab, just hover over the label and some examples will appear on the right. The examples will include actual e-mails that you receive so you have a clear understanding of what will be filtered. You aren’t able to customize the tabs or to add other tabs, but you can at least have some control over what does and does not appear in your inbox. What do you think of the new Gmail inbox? Will you be disabling the new tabs? Share your thoughts in the comments! Image is a Courtesy of Flickr. Bio: Chloe Trogden is a seasoned financial aid technology writer who covers specific opportunities such as student loans with bad credit. Her leisure activities include camping, swimming and volunteer work.